NEXT GAME: rooting for KSU to lose is not the same as rooting for SS and the Horns, right? Because I so want KSU to lose! KANSAS has to hold serve in AFH, which would give KSU at least 1 more loss. But unless KU suddenly finds its road legs (our guys started out right with a hard earned road win at TCU Monday night!) -- and someone else can beat KState the rest of the way -- playing at TT, OSU (bal-chatri!) and even OU does not bode well for our guys. In the meantime, beating TCU puts the pressure on Tech and ISU to keep pace with our guys! Here it is in graphic form HE. 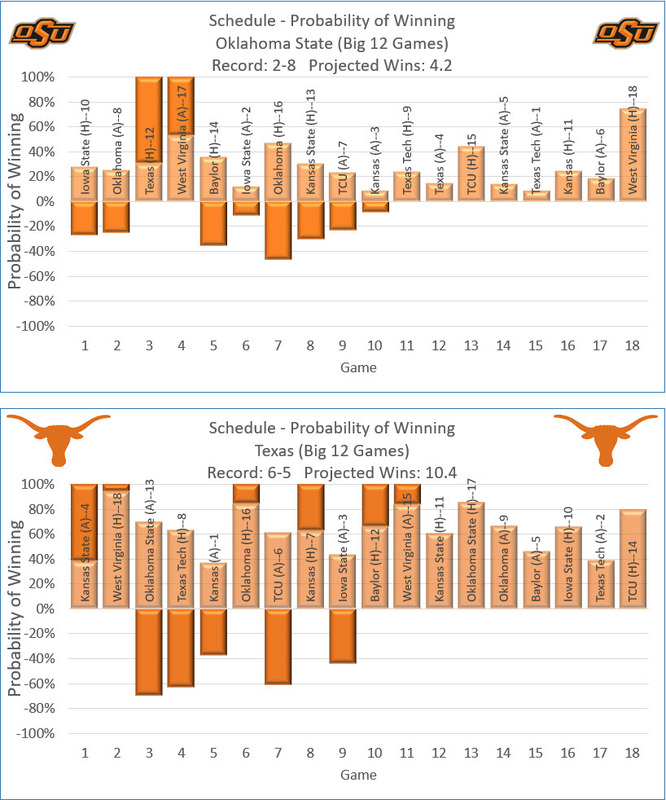 The data legend for each game shows the Opponent, Home/Away and where the game ranks in difficulty (1 through 18). KU still has their toughest game of the conference season (Texas Tech in Lubbock) but then it is all bottom half games (10-13). 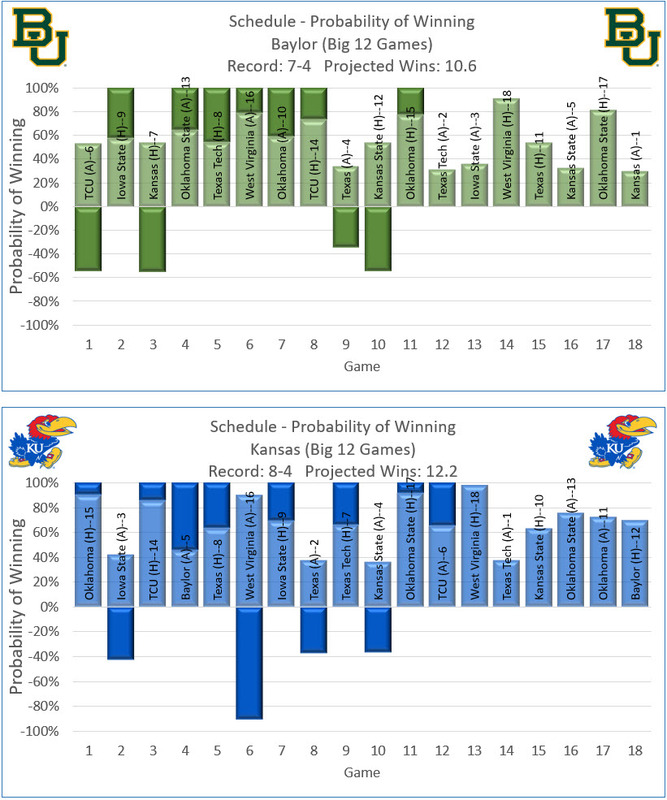 KU is projected to win 4.2 of the 6 remaining games. We need to win 5. K-St. is projected to win 5.3 of the remaining 8 games. We still trail them by 1.1 games in the probability standings. 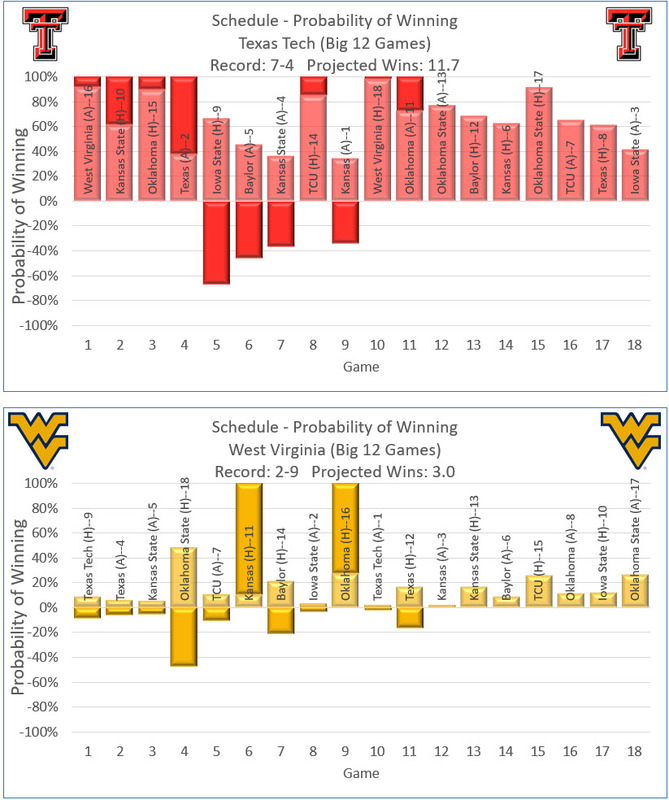 A KU win in Lubbock would make up for the loss to West Virginia. With so many of the top 5 playing each other, the herd will necessarily thin out. >KSU loses either @Texas or vs. ISU. 8-2 now. Will be 11-3. >Baylor loses @Tech OR @ISU. 7-4 now. Will be 10-5 (could be 9-6). That puts a TON of pressure on KU's trip to Tech. 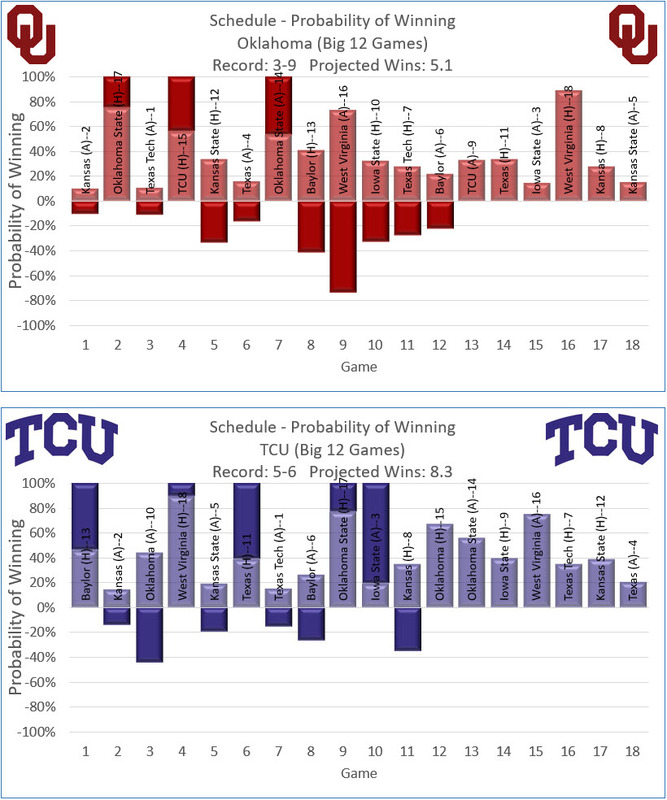 We already won at TCU and should beat WVU this weekend, so we'll be 9-4. We have next week off which should help us prep for Tech. They also have the week off. Assuming that they win @OSU and beat Baylor at home, we'll both be 9-4 heading into the game. That means somebody will emerge at 10-4 (likely one game behind KSU) and the other team will be 9-5 with 4 games left in the season. And of course, we still host KSU on the 25th. If we go in at 10-4 and KSU comes in at 11-3, a win would put us in a tie at 11-4 with 4 games left. As always, the solution is simple: just win, baby. True, but we must remember that at this point in this season it is not enough in itself for KU. 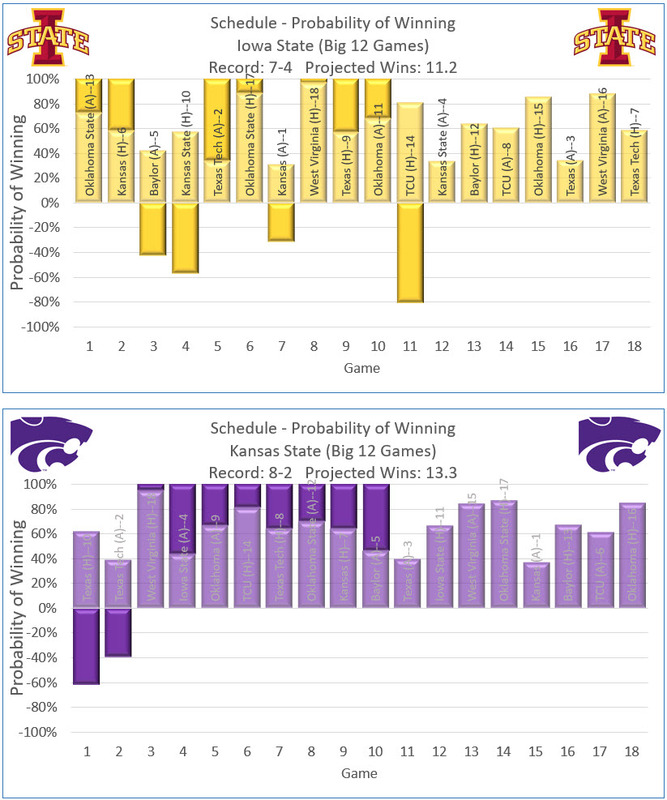 Again, KU can win out and still need someone else to beat KState once in order to tie them for a share of the title. I'm still hoping KState falls 3 times (here's to CJ's DPPI being right about that!) and KU wins out despite the DPPI projection. Step 1: KU win at TCU - done! Step 2: KState at Texas tonight -- pulling for the 'Cats to lose in Austin! ESPN had Texas at a 71% chance of winning tonight and ISU a 53% chance of winning in Manhattan on Saturday. Fingers crossed. I wonder if those % are before or after factoring in the loss of Diarra? Just hope they hold up and the 'Cats lose both. you may have seen this info already on social but with three days or more to prepare self has the second best win/loss record of any coach in the country. he has a week before texas tech on the road a week from saturdays wva game. that probably wont be factored into any model but is pretty important data i predict. plus assures i think that marcus is fully recovered and conditioned.